Peak Chemical Industries Ltd, the flagship company of Peak Group of Industries was established by Mr. D. R. Sen way back in 1976. He is a visionary technocrat entrepreneur & under his esteemed guidance, the group has been committed to & proficiently associated with the agricultural sector over the last few decades & has grown from strength to strength. Being a student of science throughout and having completed his Masters degree in Science, M Sc (Chemistry), from Calcutta University he always aimed at developing an industry in his area of interest. This strong visionary approach of his urged him to study Industrial Management from Calcutta University as well. 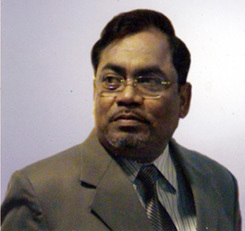 In the early years of his professional career, Mr D R Sen was associated with a few renowned companies like Albert David Ltd., Chemist, Associated Industries Ltd and Assam Pharma Ltd in the position of Senior Chemist / Chief Chemist & these initial years of his career helped in enriching his overall knowledge & added on to his experience. As an example of him being recognised for his contribution towards development of the agricultural sector it may be mentioned that Mr D R Sen was felicitated by the Honourable Chief Minister of Rajasthan at the International Conference on Vriksha Ayurveda and Establishment of Organic Practices, organized by AAHF, for his activities & contribution towards establishment of Organic and Bio products in Eastern India. Mr D R Sen has visited Netherland, Germany, United Kingdom and many other European countries as business delegate. He also visited China in the year 2002 and also in recent past, April 2012, as Business Delegate to build up business relations between the countries in the field of Organic Food Industry for present & future development in this continent. It was noted that organic agriculture is the future of the world as because people are conscious about health hazards caused by chemical fertilisers & pesticides and its residual effect on all living body – a concern to all individuals. The whole is greater than the sum of the parts. The Organisable area is divided in two separate verticals with sole the aim of providing quality products & high end services to our esteemed clients. The first vertical which is the spine of our organisation considering our core area as Research & Development is headed by Mr. Dipak Ranjan Sen, CMD of the Company. Mr. Anando Sundar Ganguly and Ms. Tanushree Chakraborty head the Production and Quality Control divisions. The production team comprises of 20 key people at different stages including field trials at our Company plot 14 Kms. from Siliguri comprising of 30 Acres of cultivable land. Administration and Human Resource Management also reports to the same vertical. Mr. Sankar Biswas, who is among one of the pillars towards implementing the decisions of the Management for the last 20 years, is heading the administrative part of the vertical and reports directly to the CMD. The other vertical is spearheaded by Mr. Daipayan Sen, Director and responsible for Marketing & Promotion of the manufactured products for both online and offline sales. Mr. Daipayan Sen is also responsible for the liasoning with State and Central Govt. departments for license and certification of the Company products under NPOP, NOP and EC guidelines. On the forefront both the verticals combine for Research and Development works and for association with different University heads. A more pragmatic approach from field to lab is taken and hence both the verticals work in unison to bring better and right products in the market place.